Belluno, Italy, lies 35 miles north of Venice at the base of the Dolomite Mountains Besides size, a visit to Belluno underscores the many​ ​similarities​ ​of​ ​our​ ​cities​: both​ ​are regional​ ​centers for​ ​government, medicinel​ ​and​ ​commerce, as well as ​recreational​ ​communities​ ​with​ ​world​ ​class​ ​winter and​ ​summer​ ​activities.​ ​​ ​Both​ ​are​ ​blessed​ ​with​ ​amazing​ ​mountain​ ​views. Belluno was recently recognized as Best Quality of Life of all Italian Cities in Italy’s most influential economic magazine. 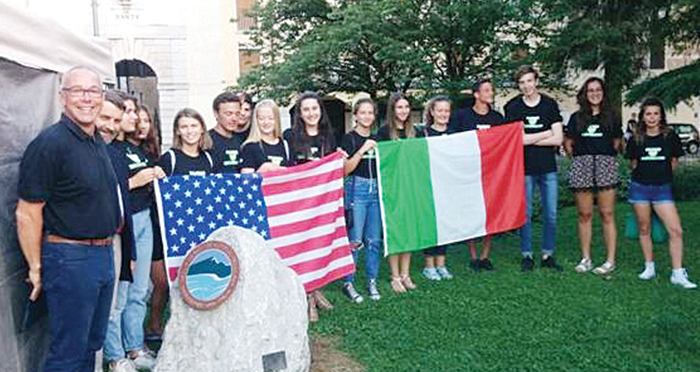 With the Bend-Belluno Sister City partnership, residents from each city are invited to learn firsthand through one-on-one relationships and reciprocal cultural exchanges the common issues the two communities share, in spite of cultural and language differences. Angelo Paganin of Belluno, Italy, goes further in speaking about our shared sister city activities, “. . . and especially the students’ exchanges are a concrete opportunity to overcome stereotypes and barriers. It is an example to a real and deep knowledge between people, an opportunity of friendship and hospitality and a way to promote the natural beauties of each side as the slogan Bella Bend Beautiful Belluno states.